They are fun, filled with music videos, reminiscences and stories. 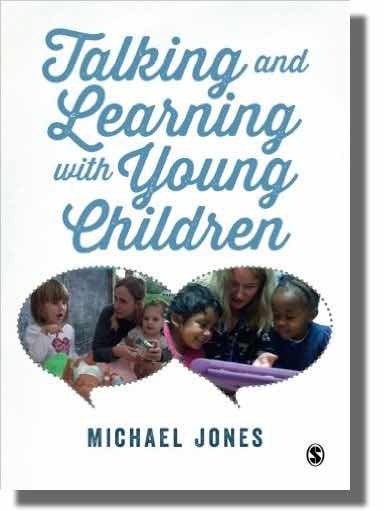 So, when Michael mentioned to me that he had a book coming out, Talking and Learning with Young Children, I immediately pre-ordered it. When the book arrived, it was even better than I’d hoped, with Michael’s enjoyment of language evident on every page. From the very start, Talking and Learning with Young Children has a positive message: ‘It is fun to talk, for the sake of talking’ and has a focus on joint learning between adults and children, rather than adults hijacking the conversation. As you would expect from such an experienced observer of children and raconteur, there are plenty of beautifully written examples of children’s interactions, in fact there are examples and case studies on almost every page. In addition, there is a very useful glossary at the end of the book. The book starts with some of the most important theories, but doesn’t get bogged down with these. Michael starts his analysis of communication with those fascinating interactions between adults and babies, which start to form the basis of verbal communication. The chapters then move through first words, talking with two-year-olds and consideration of the home learning environment. Chapters six and seven investigate the early years setting. First of all ‘quality talk’ is explored, with some excellent examples of Sustained Shared Thinking, and a range of different scenarios that practitioners will find themselves in. In chapter seven, the perennial problem of having valuable and meaningful conversations with small groups of children is examined. This is the most realistic situation for most nursery settings and Michael has included some very practical ways that adults can extend and share conversations, even when there is a large group of children. Taking a step back to look at the bigger picture, chapter eight looks at the pedagogy in a setting and how this can be organised to influence practice in a positive way, with some very thought provoking sections (see ‘Saying what you mean’ on page 157). The final chapter considers ‘Communicating complex ideas’ and explores how practitioners can support children’s thinking using quality language. This chapter starts with a fantastic example of a four-and-a-half year old grappling with the question of ‘Is Elvis real?’ (page 172). The young child’s logic is impeccable and it is a brilliant illustration of how language exposes children’s thinking processes. I think this is a book you could read just for the sheer joy of it – you don’t need to be doing a course or studying language development. It would certainly be a very valuable addition to the staff room or network group and for starting reflective conversations in staff meetings. However, I will leave the last words to Michael – Enjoyable conversation is the place where children develop as talkers. You can get the book from all good booksellers and your Amazon link is here.